There are hundreds of players whose lives will be highlighted and ultimately changed by this week’s NFL Draft. Each of these players has their own unique story, but for the Hollister twins — whose paths weaved through three colleges — it’s an ideal window to spotlight a relationship that is truly rare. 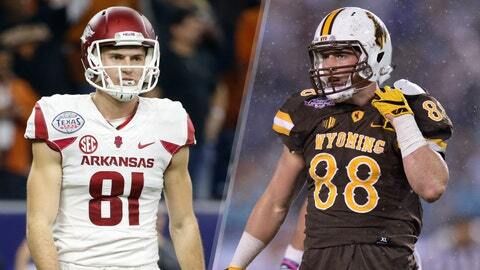 Jacob, a tight end, ended up at Wyoming. Cody, a wide receiver, finished up at Arkansas. Both are hoping to hear their names called. It probably won’t happen until Day Three, if at all, but don’t be surprised if these two former walk-ons who started their careers at Nevada end up around the NFL for a long time. On Nov. 18, 1993, Jennifer Connolly gave birth to twin boys. First came Jacob. “He was in such a rush, he shot out so quick, the nurse dropped him,” Connolly said. As close as twins often are, the Hollister brothers — whose last name comes from their father — developed a unique bond that was strengthened through some challenging times at home. When they were three years old, their parents divorced, and then they went through subsequent divorces by each of their parents later in their upbringing. For much of their lives in Bend, Oregon, Jacob was always the quarterback and Cody was his go-to receiver. That combination came up big for Mountain View High, leading the school to the 2011 Oregon Class 5A championship — the town’s first state title in 71 years. Jacob had a 31-3 TD-INT ratio and Cody caught 64 passes for 15 of those touchdowns. The brothers, who describe themselves as late bloomers physically, had some recruiting interest from Idaho, but no FBS programs offered them a scholarship, so they opted to walk-on for Chris Ault’s team at Nevada. The plan was for the twins to get in a good college weight program and develop so they could — sooner than later — earn scholarships. However, when Ault stepped down in their first season, the Hollisters looked for Plan B. In junior college, the twins got another curveball thrown at them. Arizona Western already had a pretty good QB (Tyler Rogers, who later started at New Mexico State). The staff asked Jacob to switch to tight end even though he only weighed about 210 pounds. In 2013, as a redshirt freshmen, Cody shined. He had 69 receptions for 934 yards and five touchdowns and made all-conference. Jacob’s numbers as he adjusted to his new position were modest: 10 catches, 96 receiving yards. Both were extended scholarship offers to Wyoming. But then Arkansas also came in for Cody, who had a hard time imaging life away from his twin, especially since Jacob had always acted like the big brother for him, whether that meant doing all their cooking or being the outgoing one. The brothers split in 2014. Jacob had to report to Wyoming first and had a 14-hour car ride to Laramie. The twins would talk on the phone every day, often two to three times a day. A broken foot derailed his junior season. In 2016, he shared the team’s Special Teams MVP award after making eight tackles. Jacob got to Wyoming just as Craig Bohl had come from winning national titles at North Dakota State. Bohl inherited a roster with only one tight end. The twins trained for the draft in Fayetteville, which helped Jacob produce some eye-catching results at Wyoming’s Pro Day, where at 244 pounds, he clocked a 4.64 40, vertical jumped 36.5 inches and broad-jumped 10-1. Cody, coming off toe surgery before the Hogs bowl game, didn’t have his Pro Day until earlier this week. He weighed in at 208 pounds and, not shockingly, he produced almost identical workout numbers: running a 4.53 40; vertical-jumping 36 inches and broad-jumping 10-0. NFL personnel people view Jacob as the more likely to go earlier in the draft with Cody as a possible seventh rounder/free agent type. “He’s smart, tough and can run,” said one NFL scout. “The main thing is he’s a very good special teamer. All NFL teams are looking for that back-end of the roster guy and can play on all four special teams and you can bring him along and develop his as a receiver. “Jacob really gets offensive football. He sees everything through a quarterback’s eyes and he can do everything. You can line him up in the backfield. You can put his hand in the dirt and he plays so hard, so when he lines up to block you, he’s going to be really competitive at the line of scrimmage.